Today we’re excited to talk about our very favorite subject – Custom Cabinets. You see them on the HGTV home remodels, and photos of them fill entire Pinterest boards. They seem to be the hallmark of an expensive and luxurious custom home. Custom cabinets are something you’d like… someday… when you finally build that mansion, right? Wrong! Custom cabinets seem to have this reputation for being a luxury item that only the excessively rich can afford, but it’s simply not true. 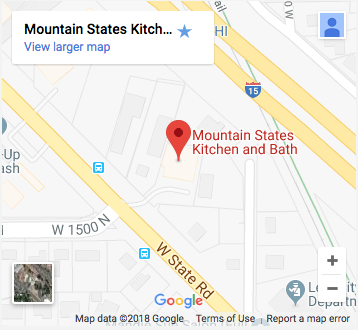 That’s why we love sharing information about our Mountain States Kitchen & Bath custom cabinets – our customers are always shocked and pleased at what custom cabinets really mean for them. Custom cabinets don’t always mean a special drawer designed to nestle each of your very expensive knives or a cabinet shelf with perfectly measured notches for cheese trays. Custom cabinets simply mean cabinets that are designed specifically for the space you have in mind. Cabinets that are built, measured, and created for your space will always look better and function more efficiently than stockroom cabinetry. Custom cabinets are built by our master carpenters after carefully measuring your space and going over your exact needs and specifications. Then the cabinets are built using the highest quality wood and craftsmanship. Custom cabinets are then painted to your exact taste and carefully installed in your kitchen or bathroom to be enjoyed for years to come. Custom cabinets are usually a higher quality than mass-produced cabinets, meaning they will last a lot longer – one of the surprises that they don’t tell you when you choose a cheaper mass-produced cabinet. It’s well worth the upgrade to custom cabinets if only for the high quality and longevity it gives you. Custom cabinets can also be, well, customized! You can add shelves instead of drawers, drawers instead of shelves, a tall wall cabinet for mop & broom, a lazy-susan in the corner, and any other number of customizations or personalizations that will make your kitchen or bathroom more useful to you. The best part? The price tag isn’t as bad as you think. Trust us. The number you’re picturing is definitely higher than Mountain States can quote you. Custom cabinetry may be more expensive than mass-produced cabinetry, or seem too expensive compared to a long and painful DIY repainting or refacing project. But the truth is that upgrading to custom cabinets for your Utah home or business in the kitchen, bathroom, or anywhere else you need cabinets will cost much less than you expect. Call today for a free consultation and be shocked at the price of materials and labor for a project that will create your dream space!